Lemongrass or Citronella also known as tanglad in Filipino, is one of those wondrous herbs used in many Asian cooking. Apart from being used as a flavouring agent for foods & beverages, it is now also used in making herbal soap because of its varied medicinal properties. Further, this oil can be used in treatment of problems like oily skin, oily hair, abnormal palpitations, colitis, migraine, neuralgia, fatigue, headache, nausea, abdominal pain resulting from gas or cramps etc. 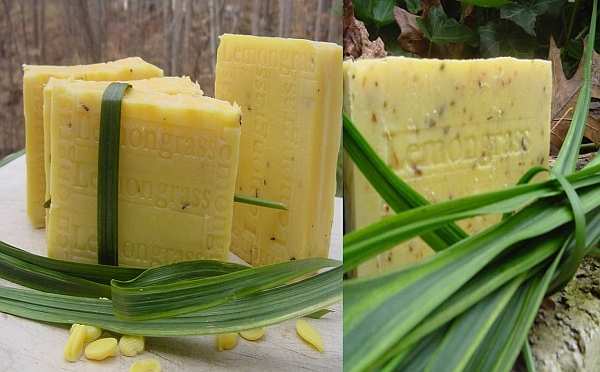 Here’s how to make your own Lemongrass Soap easily. 2.Melt the grated soap in a makeshift double boiler. To create a makeshift double boiler, place a round pyrex bowl on top of a pot of hot water. When the water boils, the bowl gets heated, creating the same effect of a double boiler. 3.Once the grated soap has melted, drop in the ounces of lemongrass essential oil and mix it into the soap with a spatula. 4.Next, put in the fresh lemongrass. Stir the mixture till the fresh lemongrass is evenly distributed. 5.Pour the soap mixture into soap molds. Tap the molds lightly so that the bubbles rise to the top. 6.Spray a bit or rubbing alcohol on the tops of the soap so that the bubbles on top all disappear. 7.Allow the soap to harden in their molds. 8.Once hard, flip the molds over, the soap should pop out. 9.You can now enjoy your lemongrass soap!